So, I’m a guitar hero. A proper one, not some two-bit button pusher ;). For such a long and distinguished musical career my output is horrendously low – but it’s all good quality stuff! To date I’ve contributed to two studio recordings. 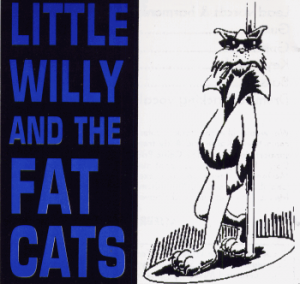 The first band, formed in my final year at Swansea University, was Little Willy and the Fat Cats. We had them low-down dirty blues but we had some success over a couple of years on the scene in Abertawe. In February 1997 we recorded a six track EP, five of which are available below. The second band, FTGaana, was a slow-burner which began while living in Watford around 1999. The music was, let’s face it, AOR, but it was and still is my first time with a group of people writing original music. I say slow-burner because we didn’t hit the studio until 2006, some seven years later. The EP appears below. Stuart it’s Will – had a random search on the internet and I was delighted to see that you are keeping the mighty Fat Cats alive – sadly my harps are gathering dust but good to see that you are still playing and doing well!